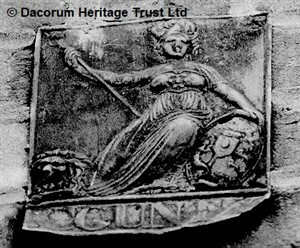 Little more than a tub of water on wheels | The Dacorum Heritage Trust Ltd.
A rather fanciful depiction of the fire at Gaddesden Place which occurred on 1 February 1905. Hemel Hempstead Brigade only had a horse-drawn manual engine, but Dickinson’s Brigade had a ‘steamer’. 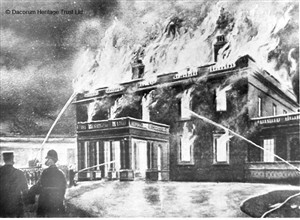 Frogmore and Berkhamsted Brigades joined in the effort, but two of the staff died and the mansion burned for days. The Hemel Hempstead Volunteer Fire Brigade officially started in November 1845. It was reputed to have been one of the oldest in the country. Before this date, the town had no regular brigade, though it did have primitive fire fighting equipment – little more than a large tub of water on wheels. A ‘firemark’ on the front of no. 128 High Street Berkhamsted. Insurance companies would only attend fires at the premises of their registered customers. An ‘engine’ was purchased in 1659 and another in 1676. The Bailiwick underwrote the expenses, vital in those days of timber-framed houses, thatched roofs and candlelight. In 1787, William Ginger offered to reconstruct the engine shed on the perimeter of his home at The Bury. Other Bailiwick accounts from the eighteenth century reveal expenditure on repairs or replacement of leather buckets. Joseph Cranstone (junior), who owned the Phoenix Iron Foundry in the High Street and also the original Gas Works, was the originator of the Volunteer Fire Brigade and acted as its Superintendent for 35 years. The Brigade started with two manual engines, both of which were made at Cranstone’s ironworks. One was provided by the Phoenix Fire Insurance Company and the other, the ‘parish-engine’, was cared for by Josiah Hales, who was paid £6 a year. The brigade consisted of 12 gentlemen volunteers and 12 paid men. The Phoenix engine only attended fires in properties insured by the company, identified by a ‘firemark’ on the wall of the building. This certainly encouraged people to be insured! Hemel Hempstead Firemen marching down Alexandra Road, Hemel Hempstead in 1938. From 1884, the brigade became a solely voluntary affair. The paid brigade ceased to exist, the Phoenix engine was recalled and the parish engine needed an overhaul. The annual grants of £25 – £50 out of the Box Moor Trust Surplus from 1885 – 1905 must have been gratefully received. However, there was never a shortage of volunteers and Captain Bird, who took over the Brigade in 1897, thought that one volunteer was worth many paid men. The first steam engine (‘steamer’), affectionately known as ‘Mabel’, was purchased in April 1907. This followed a major fire at the Halsey residence at Gaddesden Place on 1 February 1905, which underlined the need for a better engine. A new Fire House was built in the Broadway (Queensway), together with a row of shops in mock-Tudor style. Funds were raised by social events – the engines were always brought out at times of public celebration and ‘playing them’ was a big attraction. During the Second World War, the Volunteer Fire Brigade was absorbed into the National Fire Service (NFS). When the war was over, it was disbanded and responsibility for the local fire service was passed to the County Council. 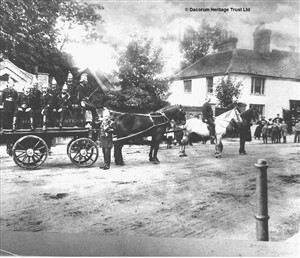 Hemel Hempstead Volunteer Fire Brigade c.1902. The Council purchased the Old Post Office building in Alexandra Road and adapted it to provide a station with much better accommodation for the equipment, together with proper facilities for training its full-time paid crew. However, despite several extensions, the building (which was later demolished) became insufficient for modern needs and in 1969 a new and larger fire station was opened in Queensway, where the service is still based. (Based on a chapter in Royalty to Commoners by Joan and Roger Hands, published by the Box Moor Trust. 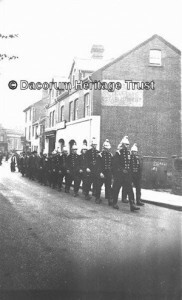 Stories about the local paper mills’ fire brigades can be found in Paper Pioneers, published by Dacorum Heritage Trust).